Ah, the life of a successful screenwriter! Sitting in your Malibu beach house finishing the script that will bring in the next million dollar check. Doing lunch at The Ivy. Hollywood party-hopping where you're the idol of stars, movie execs and paparazzi. Yeah, right! Not if you're Doing It for Money! 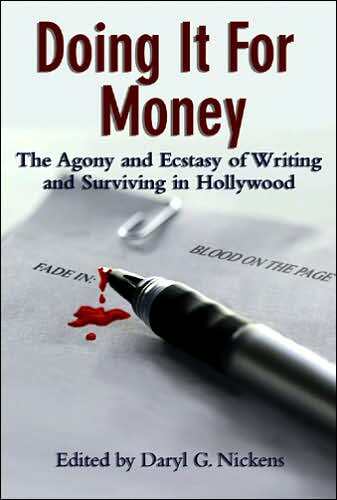 The true process of writing for the Hollywood Machine is finally revealed in Doing It for Money. Clueless executives...temperamental stars... rewrites that "re-wrong" the script you've poured your blood, sweat and tears into. Welcome to the wonderful world of screenwriting! More than a compilation of "war stories," these insightful, sometimes acerbic, but always entertaining essays from 48 top movie and TV writers cover it all: from attempting to write (and putting it off! ); to breaking in; to pitching and selling a script; to tales of rewrites, notes and unexpected "help" from execs, stars, friends of the caterer and everyone in between. Contributors include Stephen Gaghan (Syriana, Traffic, NYPD Blue), Terry Rossio (Pirates of the Caribbean, Shrek), Leslie Dixon (The Thomas Crown Affair, Mrs. Doubtfire), John Sacret Young (The West Wing, China Beach) and many more. Also included in Doing It for Money are valuable "insider" Secrets from Hollywood Pros on making it in this cutthroat industry! Here, then, is your invaluable ticket to a personal behind-the-scenes tour of what it's really like to be Doing It for Money in the mad, mad world of entertainment. Daryl G. Nickens is a former chair of the graduate screenwriting program at American Film Institute (AFI) and still teaches there, and at USC. An Emmy, WGA and Humanitas Prize nominated screenwriter, he works in film, television and animation.